Easily integrate voice solutions in your distribution operations – without programming! VoxStudio® is visual development software that lets you design and deploy voice-enabled solutions using drag-and-drop components; no programming is required. Just place pre-programmed building blocks into graphical workflow diagrams that mirror the business processes in your distribution operations. This unique, adaptive approach greatly reduces the cost and effort needed to optimize your workforce, improve the customer experience and keep pace with changing dynamics. Use one visual system from start to finish. VoxStudio’s helpful graphical interface spans design-development-deployment functions. Select built-in, pre-packaged options. Each workflow component is pre-loaded with options that you can tailor to each step in your business process. Pick and choose prompts and responses. Prompts heard by the worker, as well as the worker’s expected responses, are all pre-packaged and assembled by Voxware®, with our experts sharing best practices for designing workflows. Work at the optimal level. Save time and effort by creating and modifying voice solutions at the business process level, not the technical programming level. Choose centralized or distributed deployment. Supports and ensures full scalability for the choice that suits your operation. The benefits start quickly and never stop. Easily benefit from the functionality you need to fulfill your customers’ most demanding requirements. Consistently meet key performance indicators across a wide range of distribution functions; receive, put away, move, cycle count, replenishment, pick, pick and pass, pack and load. Accelerate fulfillment, collapsing the time between order and delivery. From the central VoxPilot dashboard, gain real-time visibility of operations within and across distribution centers and click to intervene and make adjustments as needed. Add Augmented Reality to enable vision and digital image/video capture so that the best technology is used for the specific task at hand. Ensure reliable voice recognition and conversation detection even in the noisiest environments. 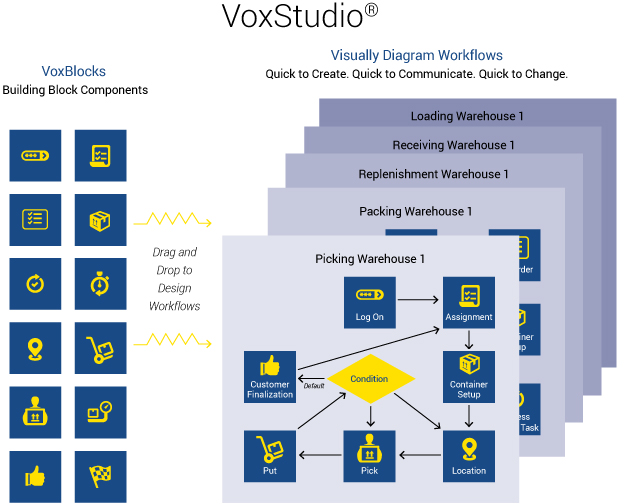 Easily configure Voxware to meet any operational requirements, using VoxStudio® to diagram voice workflows. Speed integration with warehouse management systems, new hardware and process changes using VoxConnect. Leverage purpose-built support for omnichannel fulfillment, including store and direct-to-consumer deliveries. Extend system access to diverse users and decision makers at every organizational level. Learn more about the advantages of using VoxStudio.